I joined ICOT in 1971 after ten years at the Atomic Energy Research Establishment at Harwell. On arrival at Bidston I was given a desk in what was originally the Morning Room of the Observatory which had been divided into two offices. One of these offices was occupied by Len Skinner, then Head of the Research Technology Division, and the other I shared with Ivor Chivers and Judith Daniels. Other technology staff, Alan Harrison, Alex Kerr, Tony Banaszek, Chris Walker, Bev Hughes and Doug Leighton, who was at that time the Tide Gauge Inspector, occupied rooms in the basement of the Observatory originally called the Cellars. In 1972 a prefabricated hut was erected on the front lawn of the Observatory to house the mechanical engineering workshop which was supervised by Kevin Taylor. A major project being carried out at that time was the design and development of the ICOT Offshore Tide Gauge, including the evaluation and calibration of high accuracy low drift pressure sensors for use in this equipment. In 1973 the Institute of Oceanographic Sciences (IOS) was formed by the merger of ICOT with the National Institute of Oceanography (NIO) at Wormley, the Unit of Coastal Sedimentation (UCS) at Taunton, and the Marine Scientific Equipment Service (MSES) at the Research Vessel Base (RVB) in Barry. David Cartwright moved from Wormley to become Assistant Director (IOS) at Bidston. Len Skinner was appointed as Head of MSES at Barry and I took over his role in the Research Technology Division at Bidston, which then became the Instrumentation and Engineering Group (IOS Bidston) with a staff of fifteen. In 1974 Bob Spencer moved to Bidston from Wormley, where he had worked on the design and development of the NIO Offshore Tide Gauge. This work continued at Bidston with the design, development, construction and deployment of shelf edge and deep sea versions of this equipment. With the increase in staff and equipment at that time a number of technology staff had to be accommodated in premises at the Lairage in Birkenhead where oceanographic equipment was stored, maintained and prepared for deployment at sea. The accommodation situation was considerably improved in 1975 with the completion and occupation of the Joseph Proudman Building at Bidston. As well as offices for staff, the Joseph Proudman Building had purpose designed and spacious electronics, instrumentation and calibration laboratories, a mechanical engineering design and drawing office, a well equipped mechanical engineering workshop and an assembly area for the preparation of sea-going equipment. In the new electronics laboratory Alan Harrison and Roger Palin were joined by David Flatt and Graham Ballard in 1975. Their work concentrated on current meters, thermistor chains, CTD systems and Continental Shelf offshore tide gauges. Later work also included the measurement of flow induced voltages on submarine cables, the development and use of self-contained sea-bed mounted instrument packages (PMP), and the major design, development and use of Acoustic Doppler Current Profilers (ADCP). In the calibration laboratory Tony Banaszek specialised in the evaluation, calibration and use of high accuracy low drift pressure sensors. Doug Leighton worked on the preparation, installation and maintenance of tide gauges at coastal sites and on offshore platforms and, with Bev Hughes, also designed, manufactured and deployed mooring systems for the deployment of oceanographic instruments at sea. Alex Kerr was responsible for the maintenance, preparation and use of the acoustic command and release systems used in mooring systems and in shallow and deep bottom mounted instrument packages. In 1975 Bill Ainscow and Alan Browell were appointed to the Tide Gauge Inspectorate with responsibility to operate, maintain, develop and modernise the UK National Tide Gauge Network which at that time included 34 permanent tide gauges around the coast of the UK. A major development of this Network was the introduction of the remote monitoring and data transfer facilities Dataring and Dataflow, mainly designed by Roger Palin. David Smith joined the Inspectorate in 1981 and then Les Bradley in 1990, by which time 34 of the 37 stations had been modernised to include Dataring and Dataflow systems. By 1998 an improved Dataring system had been designed and the Dataflow system had been replaced by Datalink for use by the Storm Tide Warning Service and the Thames Barrier Operations Room. 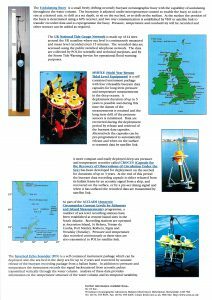 In 1977 Peter Foden joined Bob Spencer in the design, construction and deployment of deep sea pressure recorders and the design, installation and maintenance of a network of island based sea level stations in the South Atlantic and Antarctic. Major developments were a deep sea bottom pressure recorder with releasable data capsules (MYRTLE), a more compact and more easily deployable deep sea bottom pressure recorder (CROCUS), deep sea bottom mounted Inverted Echo Sounders (IES), and satellite data transmission systems for data recovery from capsules and island sea level stations. In 1992 Geoff Hargreaves joined this team and then Steve Mack in 1999. In 1985 the Taunton site of IOS was closed down and a number of Taunton staff relocated to Bidston. John Humphery moved to Bidston and continued his work on the design, development and deployment of the Sediment Transport and Boundary Layer Equipment (STABLE). He was joined by Steve Moores in 1990 and a pop-up version of this equipment was designed and built for deployment in deeper waters. In 1992 a completely new STABLE was designed and built to accommodate additional and improved sensors and with greatly increased data processing and logging capability. Peter Hardcastle also transferred from Taunton to Bidston in 1985 and worked on instrumentation to examine the interaction of sound with suspensions. A triple-frequency Acoustic Backscatter System (ABS) was designed and used to measure sediment concentration profiles in estuarine studies. 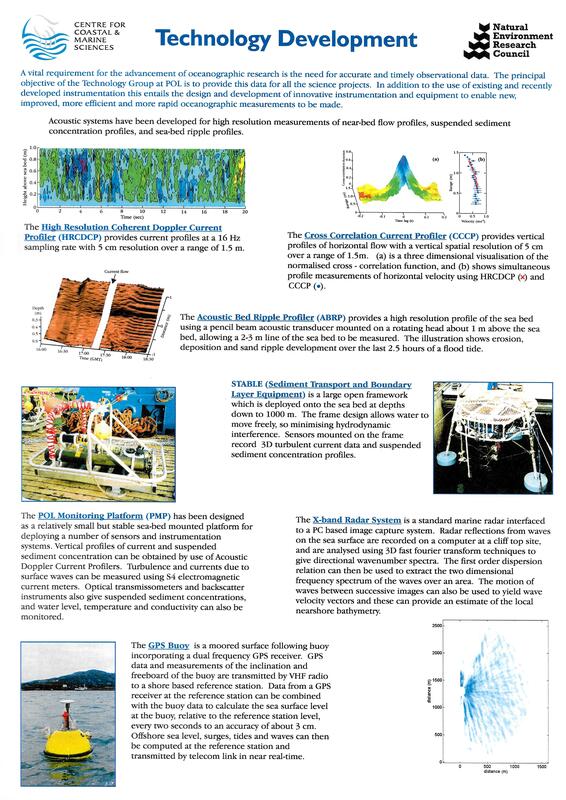 Dual-frequency self-contained instruments were designed and used for near sea-bed measurements, including a High Resolution Coherent Doppler Current Profiler (HRCDCP), a Cross Correlation Current Profiler (CCCP), and an Acoustic Bed Ripple Profiler (ABRP). Paul Bell joined the Technology Group in 1992 and worked on the use of coastal X-band radar for oceanographic measurements. Radar reflections from waves on the sea surface are recorded and analysed using 3D fast fourier transform techniques to give directional wave number spectra. These are then used to extract the two dimensional frequency spectrum of the waves over an area. The motion of waves between successive images can also be used to yield wave velocity vectors and these can provide an estimate of the local near-shore bathymetry. The Mechanical Design and Engineering Section was responsible for the design, manufacture and testing of all the specialised pressure housings, frames and other mechanical equipment required for the deployment of offshore instrumentation systems and equipment, and for the installation of coastal equipment. Since 1974 John Casson headed this team and he also headed the diving team required for the installation of coastal and rig tide gauges. In the engineering drawing office Judith Daniels was joined by John Mackinnon and Dave Dawson in 1976 and then by Dave Jones in 1990. The mechanical engineering workshop was headed by Kevin Taylor and other workshop staff included Alan Browell, Ken Parry, Jack Clarke, Jim McKeown and Emlyn Jones. Project Team: J.B.Rae (Project Leader), D.Flatt, P.R.Foden, P.J.Hardcastle, A.J.Harrison, J.D.Humphery, R.I.R.Palin, D.E.Smith, R.Spencer, P.D.Thorne. The main objective of the POL Technology Development Project (LRP3) is to develop oceanographic observational instrumentation and equipment which will enable new, improved, more efficient or more measurements to be made more readily available to support POL scientific programmes. 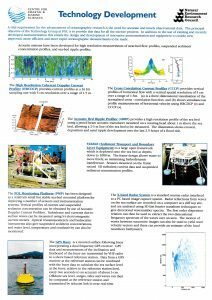 The principal developments are of sea-bed pressure recorders with reduced drift, increased deployment duration and in-situ data processing and recovery; sea-bed mounted acoustic doppler current profilers with potential for measuring turbulent structure in boundary layers; near-bed instrumentation to elucidate sediment erosion, transport and deposition; acoustic tomography techniques for Continental Shelf waters; and improved equipment for the modernisation of the UK permanent tide gauge network. 1. A deep sea pressure recorder with four releasable data capsules has been completed and was first deployed in 1992. The first data capsule was recovered three weeks later with excellent data. The remaining capsules will be recovered at yearly intervals and the main instrument recovered in 1996. Design, testing and construction of the satellite data link from the capsules will be completed in preparation for the first deployment of this system in 1994. The microprocessor controlled data handling and storage techniques developed have also been used in the development of island sea level stations. A new type of deep sea inverted echo sounder has been evaluated and techniques for processing and analysing the acoustic data have been developed. 2. A 1MHz self-contained sea-bed acoustic doppler current profiler has been developed using a digital signal processor, ‘C’ language software, Flash EPROM memory and more efficient acoustic transducers, to greatly improve the range, resolution, reliability, ease of use and deployment time. These techniques have also been used in the development of 250KHz and 75KHz instruments. The acoustic backscatter signal strength has been used to derive sediment concentration profiles and when combined with the current profile data provides a high resolution measurement of sediment flux. Nearly 100 deployments of these instruments have been made and new deployment techniques developed for use in high current regimes and for recovery of the ballast frame. 3. Theoretical and experimental studies on the interaction of sound with suspensions have confirmed the approach of using acoustic backscatter to make suspended sediment measurements. A triple frequency acoustic backscatter system has been designed and used to measure sediment concentration profiles in estuarine studies. Dual frequency self-contained instruments have been designed and used for measurements at sea. A prototype coherent doppler system for high resolution current profile measurements near the sea bed has been designed and tested. The sediment transport and boundary layer equipment has been completely redesigned with high capacity data loggers and the first deployment was successfully completed in February 1993. For the first time this provided a complete data set describing the benthic current and pressure environment and the associated suspended sediment profiles. 4. 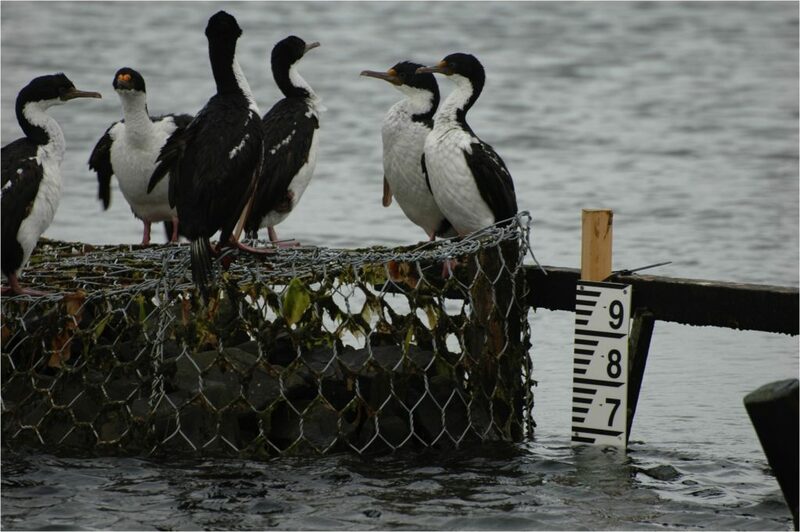 Modernisation of the UK permanent tide gauge network has been completed at 24 sites, and a further four will be completed by March 1994. High speed modems are being introduced to improve data transfer, and a new workstation has been installed at POL to control the network and to improve data processing, presentation and evaluation. A three site network has been designed and installed at Barrow-in-Furness, including an offshore site. A real time system has been installed at five east coast sites providing data directly to the STWS. A mid-tide pressure sensor system has been designed, evaluated and is being installed at new sites to improve datum control. 5. An extensive review of acoustic tomography has been completed and a report written presenting the theoretical background and highlighting the majority of experiments which have been conducted, mainly in the deep oceans. Shallow waters are acoustically more complex and POL interests would probably have to concentrate on relatively simple applications of the technique. In the early nineties the North Sea project (CRP1) was followed by a new Community Research Project called Land-Ocean Interaction Study (LOIS) with two main strands at POL, Ocean-Shelf Interactions (SES) and Coastal and Shelf Interactions (RACS). The Technology Group continued to support all the scientific projects at POL with the deployment and use of existing instrumentation systems and the development and use of new and improved systems. In 1994 the Centre for Coastal and Marine Sciences (CCMS) was formed by the merger of POL with the Plymouth Marine Laboratory (PML) and the Dunstaffnage Marine Laboratory (DML). This did result in some technology collaboration between the three Laboratories and a CCMS Technology Development Project was proposed in 1997. However, before this was fully implemented CCMS was disbanded in 2000. POL moved from Bidston to the University of Liverpool in 2004 and became part of the National Oceanography Centre (NOC) in 2010. After the completion of LRP3 in 1994 further technology work at POL included the development of a small, freely drifting, neutrally buoyant oceanographic buoy with the capability of undulating throughout the water column. 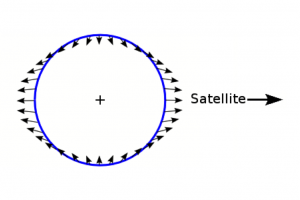 The buoyancy is adjusted under microprocessor control to enable the buoy to sink or rise at a desired rate, to drift at a set depth, to sit on the sea bed, or to drift on the surface. At the surface the position of the buoy would be determined using a GPS receiver and two-way communication would be established by VHF or satellite link to transfer recorded data and to reprogram the buoy. Pressure, temperature and conductivity can be recorded and other sensors added as required. Another development, in collaboration with IESSG at the University of Nottingham, was of a moored surface following buoy incorporating a dual-frequency GPS receiver. GPS data and measurements of the inclination and freeboard of the buoy are transmitted by VHF radio to a shore based reference station. 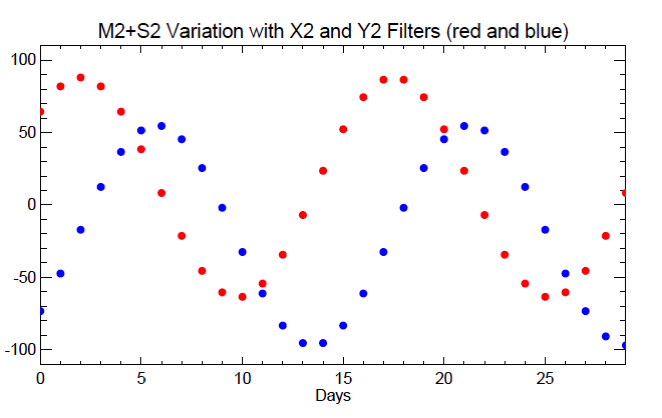 Data from a GPS receiver at the reference station can be combined with the buoy data to calculate the sea-surface level at the buoy relative to the reference station level every 2 seconds, to an accuracy of about 3cm. Offshore sea-level, surges, tides and waves can then be computed at the reference station and transmitted by telecom link in near real time. To see further details and illustrations of some of the development projects carried out by the Bidston Technology Group please click the thumbnails below. Shortly before retiring from Bidston Observatory in 1999 I put together two documents, one of these is a compilation of all the Bidston Technology Group Annual Reports from 1969 to 1998, and the other a compilation of all the minutes of the POL Fieldwork and Scientific Support Committee between 1986 and 1999. The former document includes a copy of the Final Report of the Technology Development Project 1988/94 (LRP3), referred to earlier, and the front page lists all of the staff in the Technology Group between 1969 and 1999, fifty in total, with the numbers increasing from nine in 1970 to a maximum of twenty-seven in 1995. Anyone interested in seeing these documents should inquire with the National Oceanographic Library at the National Oceanography Centre in Southampton. On retiring I was delighted to be presented with the very appropriate gift of a walking GPS receiver from the POL staff. As well as accurately measuring and recording latitude and longitude anywhere on the surface of the Earth this remarkable little instrument uses an atmospheric pressure sensor, calibrated with the GPS signal, to also measure and record its elevation above sea level. I can now report that since then I have made very good use of this instrument, although recently superseded by an even more remarkable smartphone, in navigating my way over the hills and mountains of Snowdonia and the Lake District. This short film, by Andy Lane, Andy Heath and Craig Corbett, is part of the Tide and Time exhibition at the National Oceanography Centre, Liverpool. 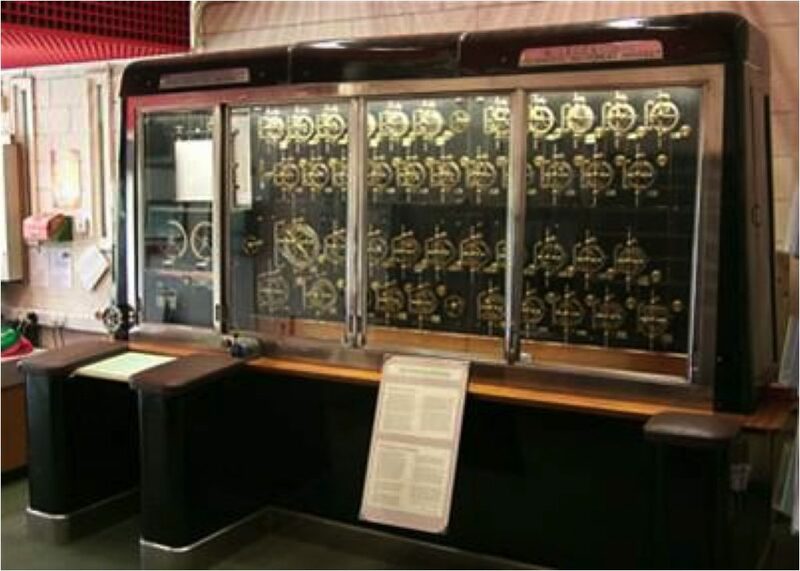 The exhibition showcases two tidal prediction machines – the Roberts-Légé and the Doodson-Légé. The film also explores the history of tidal science in Liverpool and its development as a port. Bidston Observatory was built in 1866, when the expansion of Waterloo Dock forced Liverpool Observatory to re-locate to Bidston Hill. It was built alongside Bidston Lighthouse and Signals Station, on land owned by the Mersey Docks and Harbour Board. George Fosbery Lyster was the architect. John Hartnup, astronomer and Assistant Secretary to the Royal Astronomical Society, had been the Director of Liverpool Observatory since it was built in 1843. Amongst his achievements was the calculation of the longitude of Liverpool, which was important for navigation and the development of the port. 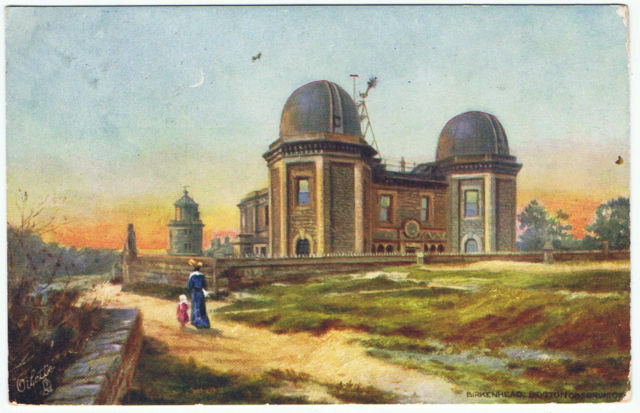 He presided over the move to Bidston Hill, and continued as director of Bidston Observatory until his retirement in 1885, when he was succeeded by his son. 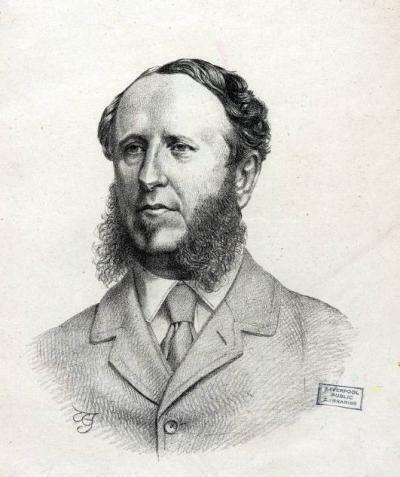 The second director, John Hartnup Jr died on 21 April 1892, when he fell from the roof of the Observatory while making meteorological observations. Over the years, the emphasis of the Observatory’s work shifted from astronomy to other things, but always in the tradition of Time and Tide, so important to the port of Liverpool. Of Time. The progression from observations of the stars, to the determination of longitude, to the calibration of chronometers was a natural one. The Observatory’s two levels of cellars and other features made it especially suited for calibrating chronometers under controlled conditions of temperature and seismic vibrations. Mariners sent their chronometers from all over the empire for calibration at Bidston. The One-O-Clock gun at Morpeth Dock was signalled from Bidston Observatory. Of Tide. Ever since Liverpool’s harbour-master William Hutchinson (the same fellow who pioneered the use of parabolic reflectors in lighthouses on Bidston Hill) took the first extended series of tidal measurements over a period of nearly thirty years, Liverpool had led the world in tidal studies. This work became centred at Bidston Observatory when the Liverpool Tidal Institute was set up there under Joseph Proudman’s direction after World War I. Arthur Doodson’s work with mechanical computers for tide prediction happened here. 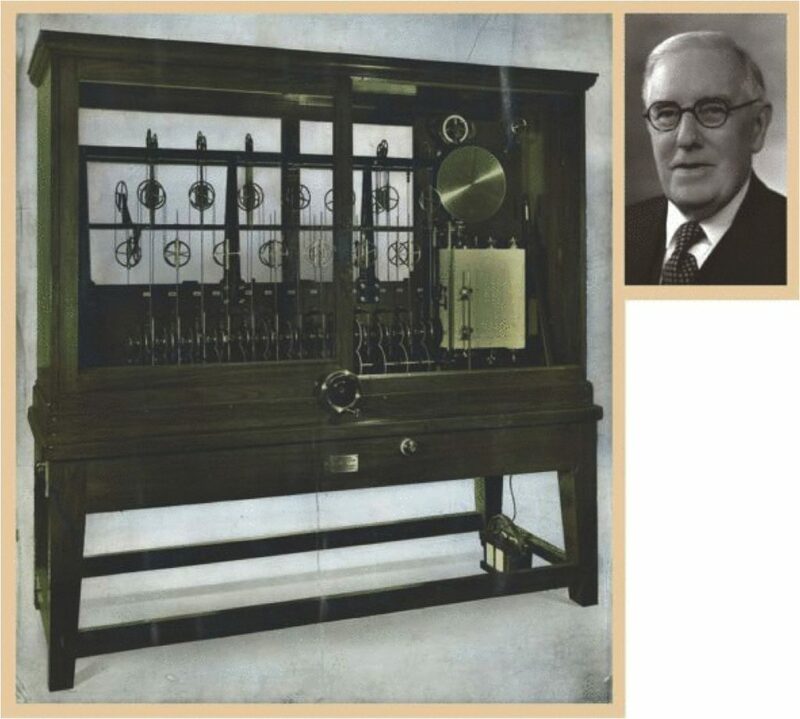 One of his machines was used to predict the tides for the D-Day landings. 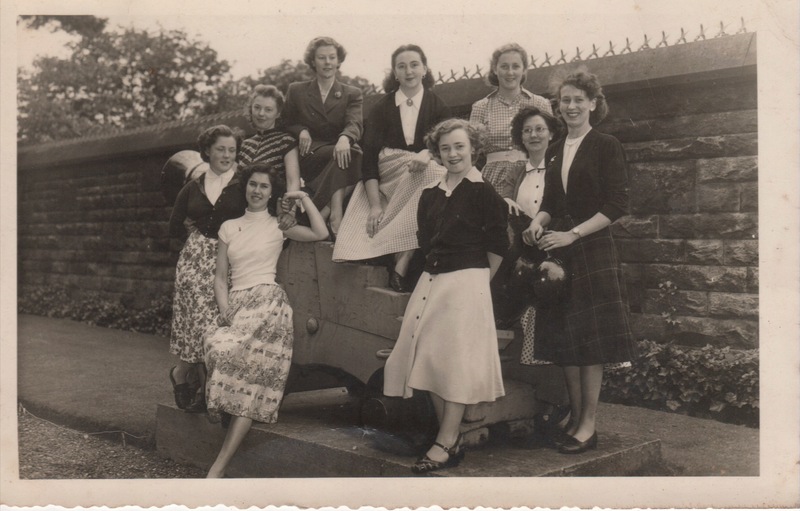 Observatory staff by the original one-o-clock gun, after its removal to Bidston Hill from Morpeth Dock. In 1969, the Natural Environment Research Council (NERC) took over responsibility for the Observatory. Oceanographic research continued to expand under their auspices. During the 1970’s, the Joseph Proudman Building was constructed in the former kitchen gardens of Bidston Lighthouse. In 1989, the Observatory, Lighthouse and the perimeter wall enclosing them became Grade-II listed buildings. In 2004, the Proudman Oceanographic Laboratory moved from Bidston Hill to a new building at the University of Liverpool. Their oceanographic research is still continuing today, but now in the guise of the National Oceanography Centre. The departure of the Proudman Oceanographic Laboratory from Bidston Hill began a 12-year limbo. NERC’s original plan to sell the site to a developer aroused opposition from local pressure groups, and the spectre of an eleven-story high-rise residential development was averted. In 2012, NERC applied for and obtained planning permission and listed buildings consent (now lapsed) to convert the Observatory into four residential apartments. Later that year, the Joseph Proudman Building was demolished. Having put the Observatory to the market on several occasions, NERC finally sold it in 2015 to a developer (Bidston Observatory Developments Limited), who had outbid a community-led consortium. This was the lowest point in the Observatory’s history. A period of systematic neglect saw a rapid deterioration of the fabric of the building and the appearance of the grounds, exacerbated by water ingress, unpaid bills and a winter with no heating, and the Observatory was nominated to the Victorian Society’s list of the top ten endangered buildings of 2016. Fortunately, the Observatory was sold again in September of 2016. The new owners have announced their intentions to operate the Observatory as a not-for-profit artists’ research centre and to incorporate an exhibition celebrating the Observatory’s scientific heritage. Judith Wolf, 1 Sep 2016. Most people know that the tide rises and falls periodically at the coast but not everyone is as aware of the periodic flood and ebb of tidal currents. These are of particular importance for mariners and need to be taken into account for navigation. Where currents become particularly strong, they can become known as a ‘tidal race’, which can be unnavigable at certain states of the tide. Around the coast of the British Isles are many locations where a tidal race forms, usually in a constricted channel between two islands or an island and the mainland. In Scotland, between the islands of Jura and Scarba is the famous ‘Whirlpool of Corryvreckan’ – possibly the third largest whirlpool in the world (after Saltstraumen and Moskstraumen, off the coast of Norway). The Gulf of Corryvreckan, also called the Strait of Corryvreckan, is a narrow strait between the islands of Jura and Scarba, in Argyll and Bute, off the west coast of mainland Scotland. 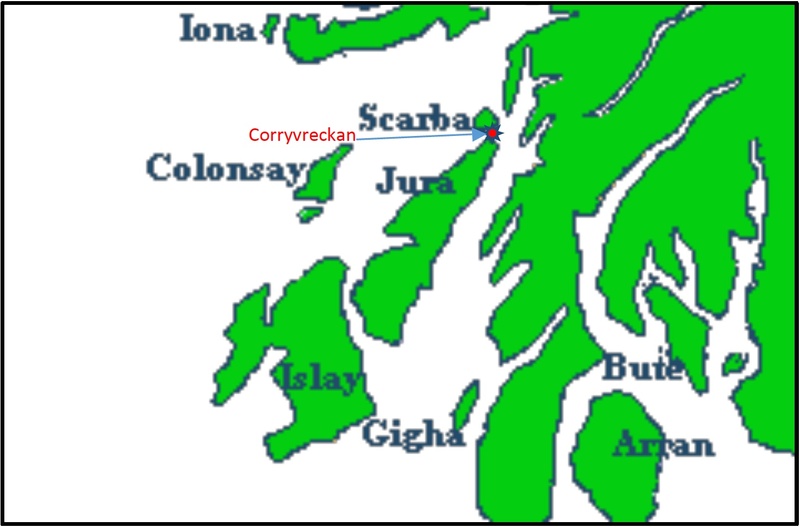 The name ‘Corryvreckan’ probably derives from two words ‘Coire’ which in Irish means cauldron and ‘Breccán’ or ‘Breacan’, which may be a proper noun i.e. the name of an individual called Breccán, although this has also been translated as ‘speckled’ from the adjective brecc ‘spotted, speckled’ etc. combined with the suffix of place – an. Corryvreckan Whirlpool, photo by Russ Baum, CC BY-SA 2.0. 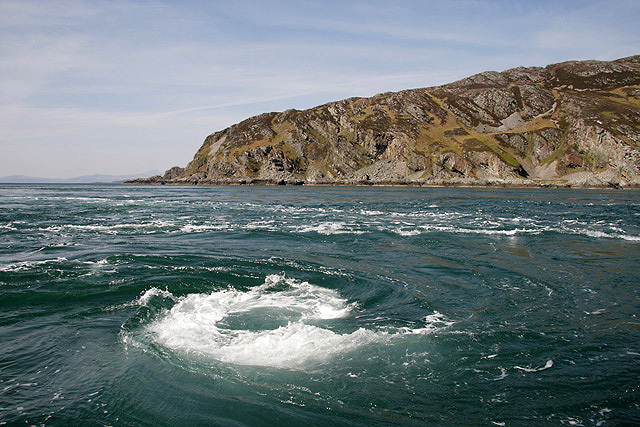 Corryvreckan Whirlpool, photo by Walter Baxter, CC BY-SA 2.0. Corryvreckan is also very close to the island of Iona, famous for St Columba, and some of the tales about the whirlpool relate to this saint and his companions, praying to be spared from falling into it, while sailing from Ireland. In one story St Columba is supposed to have encountered and recognised the bones of one Brecan, supposed to have drowned in the whirlpool with his ship and crew, years before. However, there is some dispute as to whether the location of this event was off Scotland or in another whirlpool off northern Ireland. More recently, in mid-August 1947, the author George Orwell nearly drowned in the Corryvreckan whirlpool. Orwell had fled the distractions of London in April 1947 and taken up temporary residence to write on the isolated island of Jura. On the return leg of a boating daytrip, Orwell seems to have misread the local tide tables and steered into rough seas that drove his boat near to the whirlpool. When the boat’s small engine suddenly sheared off from its mounts and dropped into the sea, Orwell’s party resorted to oars and was saved from drowning only when the whirlpool began to recede and the group managed to paddle to a rocky outcrop about a mile off the Jura coastline. The boat capsized as the group tried to disembark, leaving Orwell, his two companions, and his three-year-old son stranded on the uninhabited outcrop with no supplies or means of escape. They were rescued only when passing lobstermen noticed a fire the party had lit in an effort to keep warm. Orwell’s one-legged brother-in-law Bill Dunn was reputedly the first person to swim across the 300ft deep, mile-wide channel. Nowadays there are regular boat trips and diving trips for tourists. 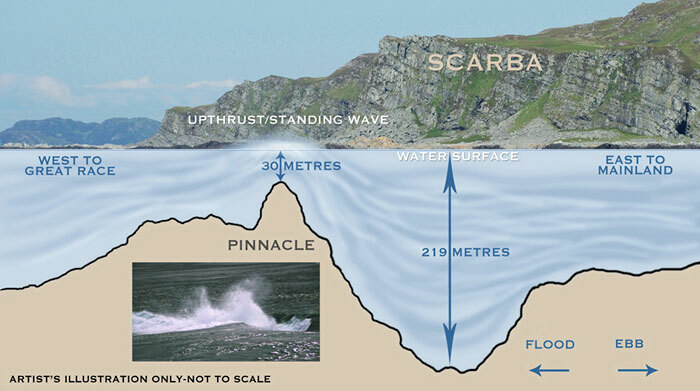 As the flood tide enters the narrow area between the islands of Jura and Scarba it speeds up to 8.5 knots (>4m/s) and meets a variety of underwater seabed features including a deep hole and a pyramid-shaped basalt pinnacle that rises from depths of 70 m to 29 m at its rounded top. These features combine to create eddies, standing waves and a variety of other surface effects. 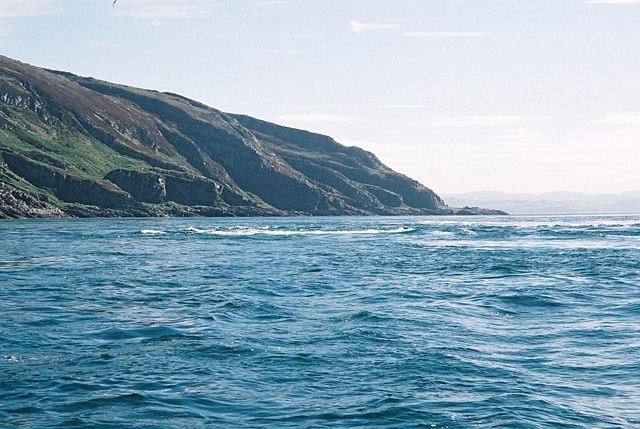 Flood tides and inflow from the Firth of Lorne to the west can drive the waters of Corryvreckan into waves of more than 30 feet, and the roar of the resulting whirlpool can be heard ten miles away. Image from Hebridean Wild website. Although dangerous when the flood or ebb tide is running and particularly when the wind is blowing ‘against the tide’ (when choppy seas make it very dangerous), it can be safely crossed at slack water when the weather is calm. This is where accurate tidal predictions come into their own, to identify the safe passage times of slack water, although detailed modelling of these areas of complex bathymetry is still a challenge. Philip L. Woodworth, 4 August 2016. 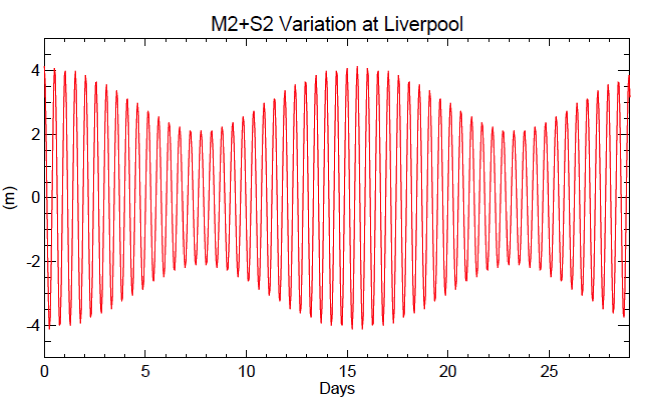 One of the main objectives of the research at Bidston Observatory was to understand more about the dynamics of the ocean tides, that is to say, the physical reasons for why the tide propagates through the ocean as it is observed to do. Before the advent of digital computers, the only way to approach these questions was from basic mathematical perspectives, in which eminent scientists such as Pierre-Simon Laplace in France excelled in the 19th century, and in which Joseph Proudman at Bidston was an acknowledged expert in the 20th century. Similarly, there has always been considerable interest in the reasons for large non-tidal changes in sea level, including in particular those which occur due to the ‘storm surges’ generated by strong winds and low air pressures in winter. For example, following the Thames floods of January 1928, Arthur Doodson at Bidston chaired a committee for London County Council that undertook a detailed study of the reasons for the storm surge that caused the flooding, and made recommendations for protecting the city in the future. 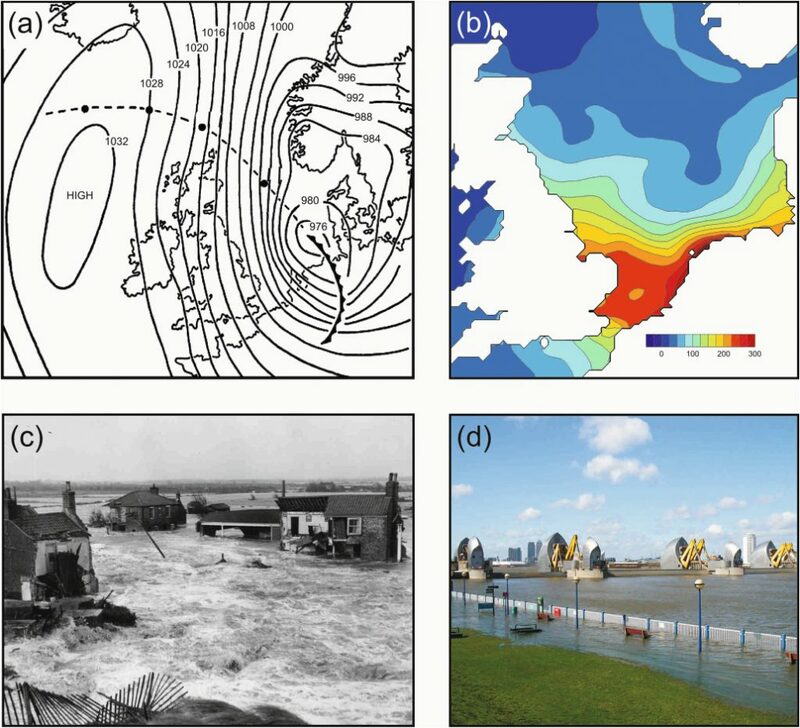 These areas of research were revolutionised in the mid-20th century, stimulated by public concerns following the major floods and loss of life in East Anglia in 1953 (Figure 1c,d), and finally made possible by the availability of modern computers in the 1960s. An important person in using computers in this work at Bidston was Norman Heaps, who joined the staff in 1962 and was eventually joined by a group of ‘modellers’ and ‘student modellers’ including Roger Flather, Judith Wolf, Eric Jones, David Prandle and Roger Proctor. 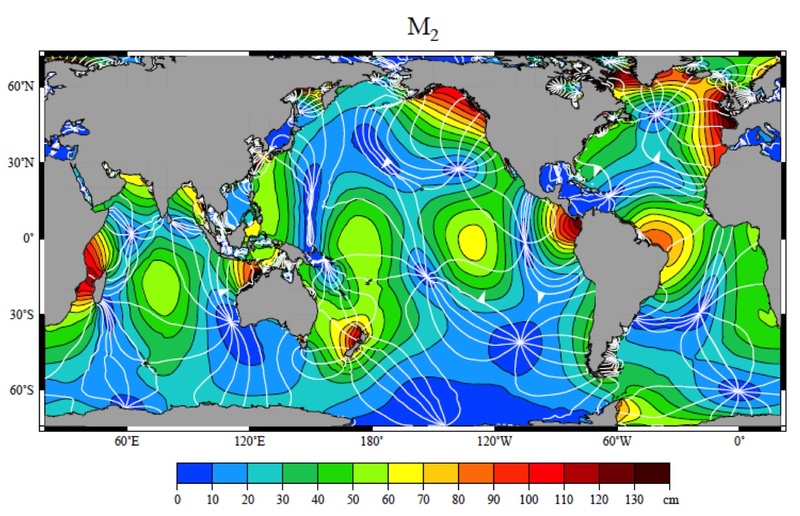 Computer modelling of the tides has many similarities to the modelling of storm surges. In both cases, there are external forces involved: gravitational due to the Moon and Sun in the case of the tides, and meteorological (winds and air pressure changes) in the case of storm surges. These forces are exerted on the water surface inducing currents and redistributing volumes of water. So the first thing a modeller has to know is how much the forces are. These are provided from astronomy in the case of the tides, and from meteorology for storm surges (e.g. information from the Met Office). 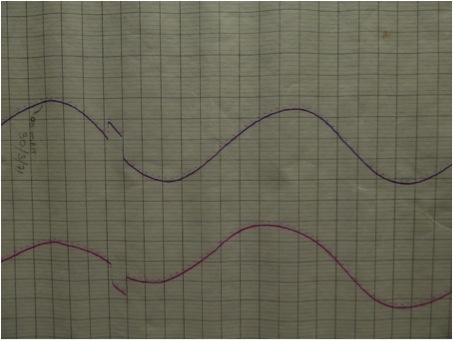 In the case of the 1953 storm surge, the effect of the wind can be appreciated from Figure 1(a) which shows a deep depression crossing from west to east and strong winds from the north pushing water into the southern part of the North Sea. The winds are especially important in this case: their force is determined by the ‘wind stress’, which is proportional to the square of the wind speed, and the dynamics are such that a greater surge occurs when wind stress divided by water depth is maximum. In other words, bigger surges occur in shallower waters, such as those of the southern North Sea or the German Bight. Figure 1. Images from the 1953 North Sea storm surge that resulted in over 2500 fatalities, mostly in the Netherlands and eastern England. (a) Meteorological chart for 1 February 1953 (0 hr GMT) with the track of the storm centre shown by black dots in 12-hour steps from 30 January (0 hr) to 1 February (0 hr); (b) maximum computed surge throughout the area (cm); (c) flooding at Sea Palling on the Norfolk coast of England; (d) the Thames Barrier, an example of the considerable investment in coastal protection in the United Kingdom and Netherlands following the 1953 storm. For image credits, see Pugh and Woodworth (2014). The next problem is to determine what the impact of these forces is, and for that the computer solves sets of mathematical equations at each point on a grid distributed across the ocean (e.g. Figure 2); these equations are in fact the same ones that Proudman and others used but could not be applied in this way at the time. The output of the models consists of long records of sea level changes and of currents at all points in the grid: as an example, Figure 1(b) provides a map of the maximum resulting surge during the 1953 storm surge event. Layers of ‘nested models’ enable very detailed information to be provided to coastal users in particular localities. Figure 2. The grid used for the numerical surge model employed in the current UK operational surge forecasting system. Only a section of the grid is shown to give an impression of model resolution and matching of a finite-difference grid to a coastline. The complete grid covers the entire northwest European continental shelf from 40° to 63° N and eastwards of 20° W. The model is forced by winds and air pressures covering the entire North Atlantic and Europe on a 0.11° grid indicated by dots. From Pugh and Woodworth (2014). 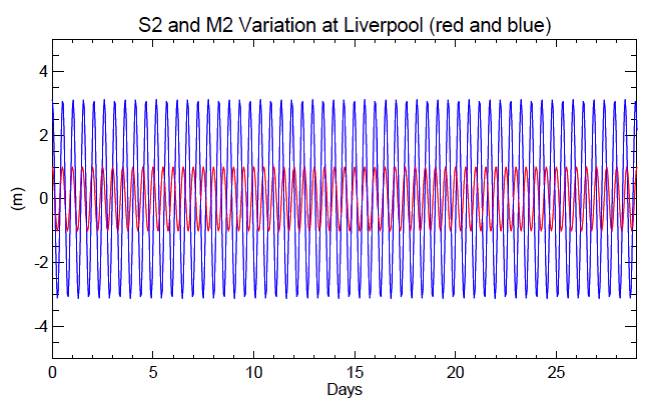 As Figure 1 demonstrates, surge modelling is particularly important to people who live at the coast. The Met Office can provide data sets of winds and air pressures up to 5 days ahead, which can be used to force the computer models. And, because the models can thankfully run faster than ‘real-time’, they can provide forecasts of what the likely magnitudes of storm surges will be several days ahead, enabling flood warnings to be issued. In the case of London, the operational warnings can be used to decide whether or not to close the Thames Barrier (Figure 1d). These forecast techniques, developed at Bidston by Norman Heaps, Roger Flather and others, were first used operationally at the Met Office in 1978, and successor models, which are conceptually the same, are still used there, providing warnings to the Environment Agency. Similar schemes have been adopted by other agencies around the world. Storm surge models developed at Bidston have also been applied to areas such as the Bay of Bengal where surges can be considerably larger than around the UK and where there has been a large loss of life on many occasions. Modelling at Bidston later developed into studying the 3-dimensional changes in the ocean that result in the transport of sediments or pollutants (‘water quality modelling’) or that have impacts on ecosystems. Modelling has also been applied to topics such as the safety of offshore structures and renewable energy. The same sort of computer modelling is now used throughout environmental science. For example, the models that the Met Office uses for weather forecasting, or the Hadley Centre uses to predict future climate use the same principle of solving physical equations on a grid. But every modeller knows that their model provides only an approximate representation of the real world, and to help the model along there is sometimes a need to include real measurements into the model scheme, in order to constrain the mathematical solutions on the grid. These are called ‘assimilation models’, of which forecast weather models are the most obvious examples. This enables us to return to tide modelling. Scientists at Bidston developed many regional models of the ocean tide for engineering applications as well as scientific research. These models tended to have ‘open boundaries’ where the region of the model grid meets the wider ocean. In these cases, it is normal to prescribe ‘boundary conditions’ which specify the tide at the boundary, and which are in effect a form of data assimilation. However, if one wants to make a tide model for a large region or for the whole ocean, with no boundaries, it was found that there were problems with obtaining acceptable results, as the assumptions which go into the computer codes were not universally applicable or missed some aspects of the tidal dynamics. Assimilation of sea level measurements by tide gauges and from space by radar satellites provided a solution to these problems. In the last decade, a number of excellent parameterisations of the global ocean tide have become available. Some of these parameterisations are based purely on measurements from space (e.g. Figure 3), others are based on computer tide models that make use of only the known dynamics, and others are hybrid models that employ data assimilation. 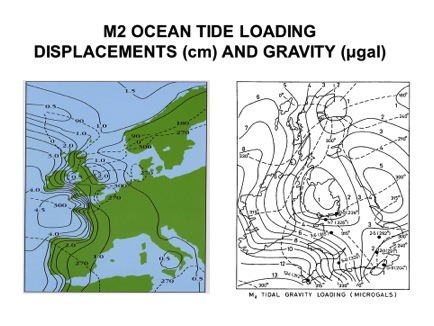 The two latter schemes provide information on tidal currents as well as tidal elevations. All three techniques are in agreement to within 1-2 cm which is a superb achievement. Proudman could never have dreamed of knowing the tide around the world so well, and it is thanks to him and others at Bidston leading the way that we now have an understanding of why the tide is so complicated. Figure 3. Co-tidal chart of the M2 ocean tide: global map of lines joining places where high tides for M2 occur simultaneously, and places with equal tidal range. The lines indicate Greenwich phase lag every 30°, a lag of zero degrees being shown by the bold line, and the arrows showing the direction of propagation. The colours show amplitudes. Map provided by Richard Ray (Goddard Space Flight Center) for Pugh and Woodworth (2014). The tide and surge models we have described above are usually operated in 2-dimensional mode (i.e. with the currents at each point in the grid taken as averages through the water column), and such model codes are relatively straightforward to construct and fast to run. A big change since the early days of the 1960s that first saw their construction is that modellers nowadays tend not to write their own codes, but instead adapt sophisticated modelling code packages written by others. This enables them to construct the 3-dimensional models of much greater complexity that are now used in research. Numerical computer modellers now comprise one of the largest groups of scientists in oceanography laboratories such as the National Oceanography Centre in Liverpool (the successor of Bidston Observatory). Their models provide a way to make maximum use of oceanographic measurements from ships, satellites and robotic instruments in the ocean (and the ocean is a big place and there are never enough measurements) and a way to forecast how conditions in the ocean might evolve. It is inevitable that oceanography and many other aspects of science will rely on modelling more in the future. Cartwright, D.E. 1999. Tides: a scientific history. Cambridge University Press: Cambridge. 292pp. Heaps, N.S. 1967. Storm surges. In, Volume 5, Oceanography and Marine Biology: an Annual Review, edited by H.Barnes, Allen & Unwin, London, pp.11-47. Murty, T. S., Flather, R. A. and Henry, R. F. 1986. The storm surge problem in the Bay of Bengal. Progress in Oceanography, 16, 195–233, doi:10.1016/0079-6611(86)90039-X. Stammer, D. and 26 others. 2014. Accuracy assessment of global barotropic ocean tide models. Reviews of Geophysics, 52, 243-282, doi:10.1002/2014RG000450. 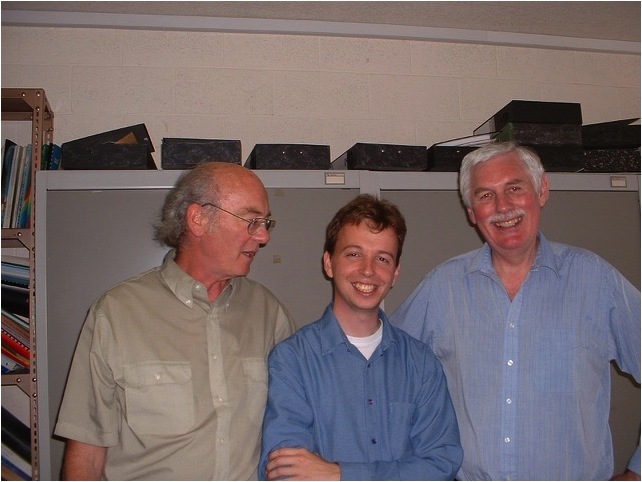 Wolf, J. and Flather, R.A. 2005. Modelling waves and surges during the 1953 storm. Philosophical Transactions of the Royal Society, A, 363, 1359–1375, doi:10.1098/rsta.2005.1572. Everyone knows that the level of the sea goes up and down. Most of these changes in level are due to the ocean tide (at Liverpool the level changes due to the tide by more than 8 metres at ‘spring tides’), but changes of several metres can also occur due to ‘storm surges’ that occur during bad weather, while slow changes in level can take place due to climate change and because of the geology of the adjacent land. Vertical scales fixed to a jetty or dock entrance. These were simple ‘rulers’ (sometimes called ‘tide poles’ or ‘tide boards’), by means of which the sea level could be measured by eye. An example is shown in Figure 1. Figure 1. A simple ‘tide pole’ or ‘tide board’ installed vertically in the water by means of which the water level can be estimated by eye. Float and stilling well gauges. This way of measuring sea level was first proposed by Sir Robert Moray in the mid-17th century. However, over a century went by before the first practical systems were introduced at locations in the Thames during the 1830s. They quickly become the standard way of measuring sea level and by the end of the 19th century they had spread to major ports around the world. A stilling well is a vertical tube with a hole at its base through which sea water can flow. The level inside will be, in principle, the same as that of the open sea outside, but energetic wave motion will be damped (or ‘stilled‘) inside due to the hole acting as a ‘mechanical filter’. 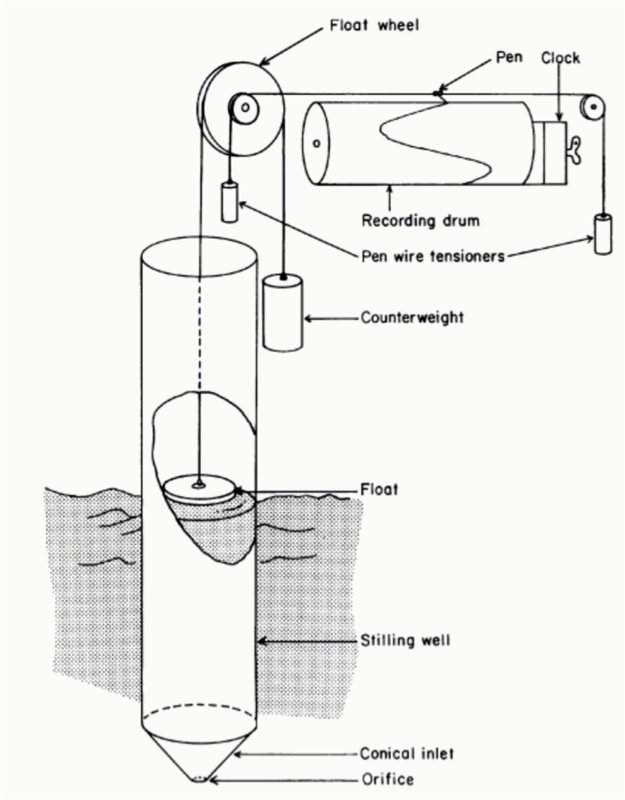 In the well is a float which rises and falls with the water level, and is attached via a wire over pulleys to a chart recorder driven by an accurate clock. 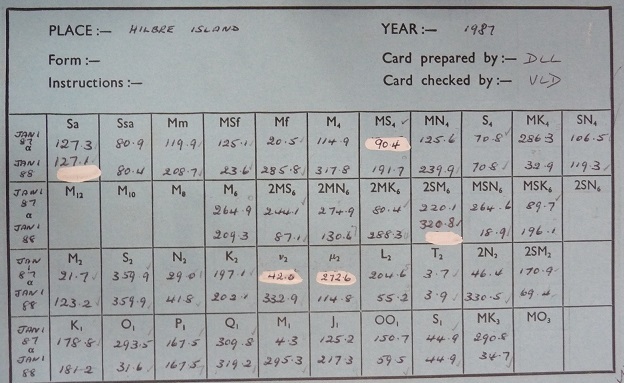 The rise and fall of the water level is thereby recorded as a line traced by a pen on paper charts that are regularly replaced, the charts finding their way to a laboratory such as that at Bidston Observatory, where an operator ‘digitises’ the pen trace and so provides the measurements of sea level. Figure 2(a) demonstrates how the level of the float is recorded on the paper chart, while Figure 2(b) is a photograph of the tide gauge station at Holyhead where there are two exceptionally large stilling wells. Figure 2a. An example of a float and stilling well tide gauge. In modern gauges of this type, the recording drum and the paper charts are replaced by digital shaft encoders and electronic data loggers. Figure 2b. Two large stilling wells at Holyhead in North Wales. This type of gauge is of historical importance as they were used for almost two centuries (although with modern improvements such as replacing the paper charts with modern electronic data loggers) and so data from them make up the data sets of sea level change that are nowadays archived at the Permanent Service for Mean Sea Level (PSMSL) in Liverpool and used for studies into long-term climate change. 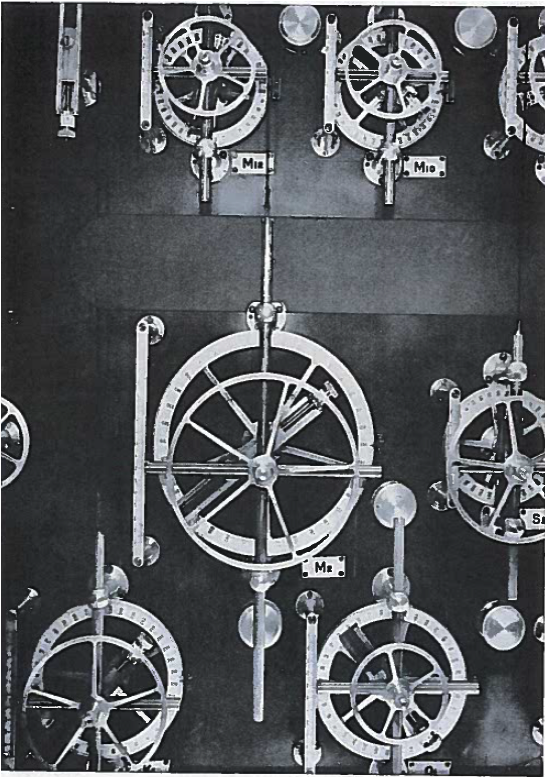 During the 19th century, most of these gauges were operated in the UK by the major ports, and even by the railway companies which operated ferries. Bidston Observatory operated one at Alfred Dock in Birkenhead for many years. A number of countries still operate float and stilling well gauges although most in the UK have been replaced with other types. These gauges measure sea level by recording water pressure with the use of a pressure sensor that is installed well below the lowest likely level of the water. The recorded pressure will be the sum of two forces pressing on the sensor: the pressure due to the water above it (which will be the sea level times the water density and acceleration due to gravity) and the pressure of the atmosphere pressing down on the sea surface. In practice, the latter can be removed from the pressure measurement using what is called a ‘differential’ sensor, thereby, after some calculation, providing a measurement of the sea level. We mention two types of pressure sensor below, which were both developed at Bidston. One type (the bubbler pressure gauge) has been used at 45 locations around the UK for several decades and remains the main technology for sea level measurements in this country. Until recently (mid-2016), this large network was operated for the Environment Agency by a group at Bidston called the Tide Gauge Inspectorate, and then, following relocation, at the National Oceanography Centre in Liverpool. These devices consist of a transducer that is installed over the sea so that it can transmit a pulse down to the water, where the pulse is reflected back and recorded by the transducer, so measuring the time taken to travel down and back. If one knows what the speed of the pulse is, then one can readily compute the height of the transducer above the sea, and so measure sea level. The transmitted pulse can be either an acoustic one (sound), or electromagnetic (radar) or optical (light). During the last decades of the 20th century, acoustic systems became very popular and replaced float gauges, and even replaced pressure gauges in some countries. However, they have since been largely replaced in their turn by radar gauges for several reasons. One simple reason is relative cost. However, radar gauges are potentially more accurate than acoustic systems owing to the speed of a radar pulse, unlike sound, being independent of air temperature. Optical ranging gauges use lasers to transit the pulses but, to my knowledge, are used in only two countries (Canada and South Korea). Bidston Observatory had expertise in all of these types of tide gauge, but three can be mentioned in which Bidston scientists took a special lead. 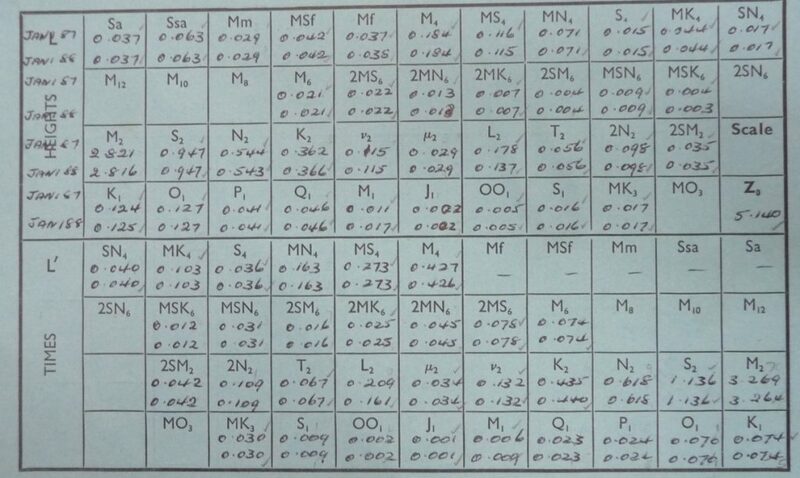 In the late 1970s, the Institute of Oceanographic Sciences (IOS, as Bidston Observatory was then known) was encouraged by the government to see if the new types of tide gauge then becoming available would be suitable for replacing the float and stilling well gauges then standard in the UK. 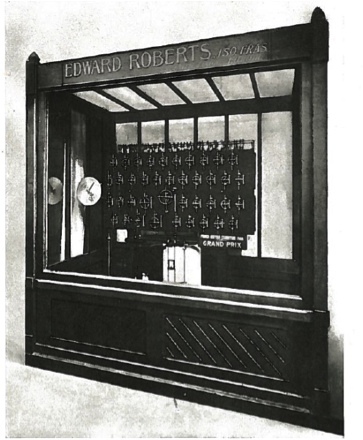 This led to a programme of research by David Pugh and others into the use of different types of pressure gauge, including the bubbler gauge, and the curiously-named ‘non-bubbling bubbler gauge’ which we shall not explain. Bubbler gauges were not invented at Bidston but they were developed there into practical instruments. They offered advantages over other pressure sensor systems in which the sensors themselves are installed in the water. In a bubbler system, the only equipment in the water is a tube through which gas flows at a rate sufficient to keep the tube free of water, such that the pressure in the tube is the same as that of the water head above the ‘pressure point’ at the end of the tube (Figure 3). The pressure sensor itself is located safely at the ‘dry land’ end of the tube, so there are no expensive electronic components that could be damaged in the water. If the tube is damaged it is simple and cheap to replace. The only drawback is that a diver is needed to install the tube, although the same need for a diver applies to all other pressure systems. Figure 3. A outline of the bubbler pressure gauge system. (From Pugh and Woodworth, 2014). 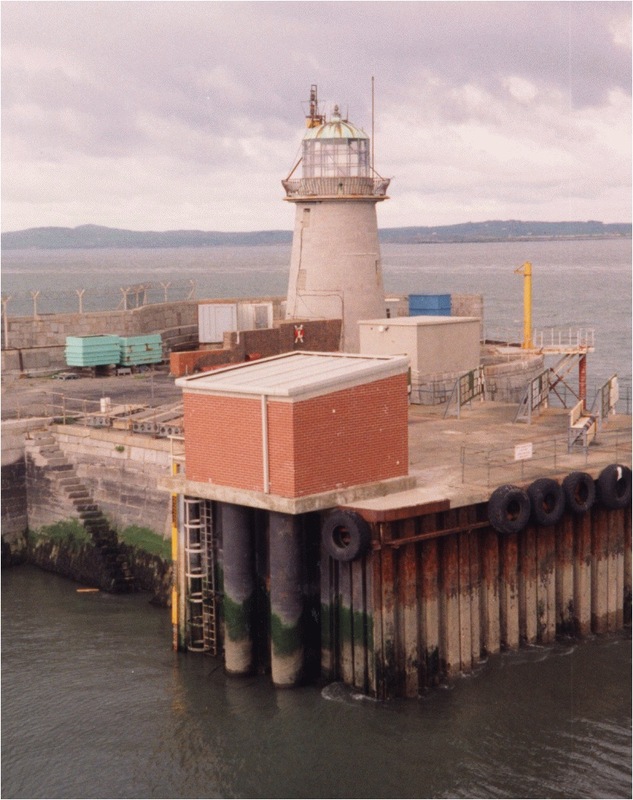 Comparisons of the old (float and stilling well) and new (bubbler) gauges were made at various locations, including at the important tide gauge station at Newlyn in Cornwall. In addition, the way that they measure sea level was thoroughly understood from both theoretical and experimental perspectives. The conclusion of the research was that bubbler pressure gauges could be reliably installed across the network. Bubblers are now standard in the UK and Ireland although they have since been replaced in countries such as the USA by other systems. ‘B’ gauges (where B stands for Bidston). These gauges were developed in the 1990s by Bob Spencer, Peter Foden, Dave Smith, Ian Vassie and Phil Woodworth for the measurement of sea level at locations in the South Atlantic. They are rather complicated to explain in this short note, but the gist of the technique is that it uses three pressure sensors to measure sea water pressure (as in a bubbler gauge) and also maintain the datum (measurement stability) of the data in the record. ‘B gauges’ are probably the most accurate and stable types of tide gauge ever invented, but they are expensive (because of the requirement for three sensors) and were never developed commercially. Nevertheless, the principle of the ‘B technique’ was eventually incorporated into the way the bubblers were operated in the UK network, which remains the situation today. Bidston Observatory cannot claim to have invented radar tide gauges; these radar transducers were developed first for the measurement of liquids and solids in giant industrial tanks, and were then applied to the measurement of river levels. However, Bidston can claim to have been one of the first laboratories to have used radar gauges for measuring sea level, a one year comparison of radar and bubbler data from Liverpool having shown that radar was a suitable technique for a tide gauge (Figure 4). Radar gauges have since fallen in price, are even more accurate than they were, can be readily interfaced to any kind of computer, and consume less power (an important feature in remote locations where gauges have to be powered from solar panels). They have become the standard technique for measuring sea level around the world and look like remaining so in the future. Figure 4. 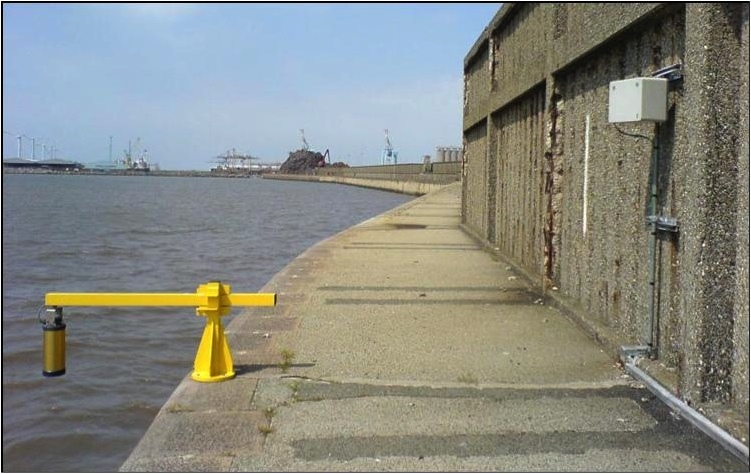 A radar tide gauge at Gladstone Dock in Liverpool. The gold-coloured radar transducer transmits pulses down to the water and so measures sea level. The grey box on the wall is a satellite transmitter that sends the data to the laboratory. Bradshaw, E., Woodworth, P.L., Hibbert, A., Bradley, L.J., Pugh, D.T., Fane, C. and Bingley, R.M. 2016. 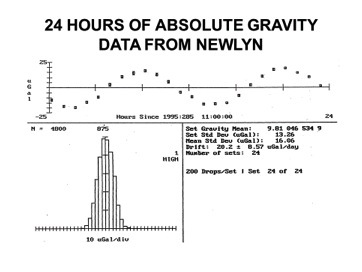 A century of sea level measurements at Newlyn, SW England. Marine Geodesy, 39(2), 115-140, doi:10.1080/01490419.2015.1121175. IOC. 2015. 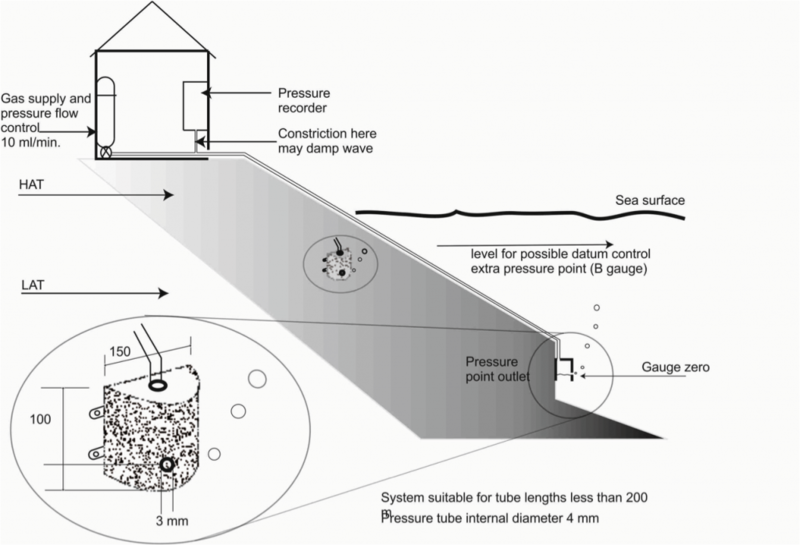 Manual on Sea Level Measurement and Interpretation. Manuals and Guides 14. Intergovernmental Oceanographic Commission. Volumes I-V may be obtained from http://www.psmsl.org/train_and_info/training/manuals/.